Once again, Mother Nature was the talk of the town. As the City—with snow plows and sanitation crews at-the-ready—braced itself for more white stuff, I anticipated the snowstorm in a different way—by rustling up a big pot of slow-cooked navy beans. In the early 20th century, these small white beans were a staple of the U.S. Navy. With good reason. Wonderfully versatile, they’re an excellent source of quality protein, folate, magnesium, potassium and iron. Eating navy beans regularly can help protect against high blood pressure and reduce risk of heart attack. Rich in complex carbohydrates and high in dietary fiber, navy beans also help lower cholesterol, promote colon health, stabilize blood sugar and maintain energy levels. Trust me—a runner with a big appetite—they’re filling! Cooking with dried beans really is worth the extra effort. They’re cheap. And they taste better (I swear!) than canned beans, which can get mushy cooked over a long period of time. Since the beans take center stage in this dish, I started with really good dried navy beans, procured from a local health food store with high turnover. You can also buy them in bulk at Whole Foods. To soak or not to soak? I’m a lazy bean cook who generally doesn’t bother with presoaking. This time, however, I soaked them for six hours in a couple changes of cold water (why not do everyone’s digestive system a favor?). Then, I quick-cooked them. It’s like blanching: you partially cook the beans before adding to your final dish and cooking them all the way through. 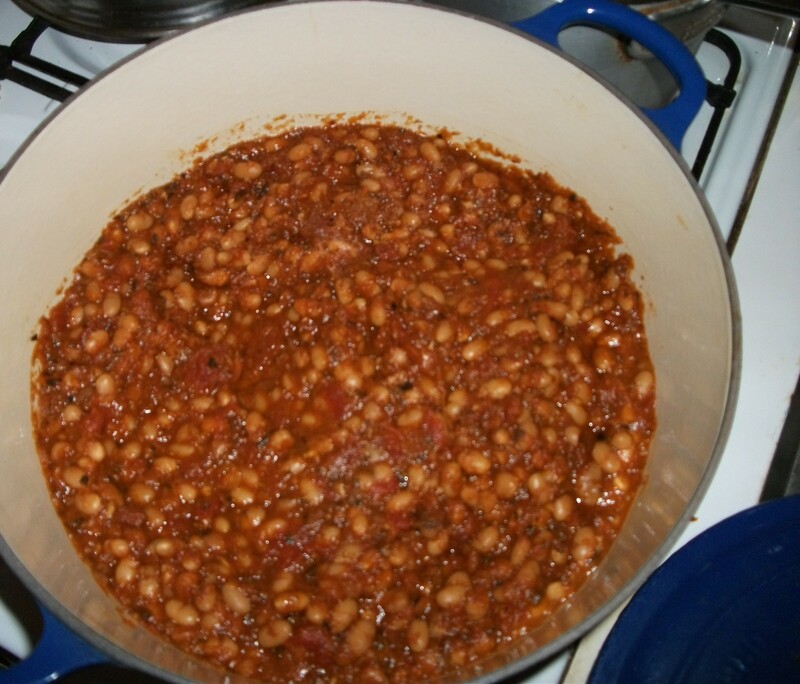 I craved herbs, white beans and tomato sauce, the main elements of this bean stew. To this, I added pancetta, chipotle powder and tomato paste for spicy heat and smoky depth. 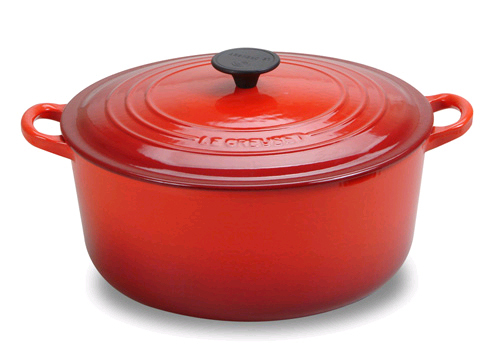 This happy marriage came to life in my enameled cast iron French oven (Le Creuset), where the beans gently burbled in a red sea of vegetables, herbs and spice. Their savory-sweet aroma filled our apartment with a fragrant warmth as intense as the steam heat hissing from our radiators. By early evening, the snow began falling—and accumulating—in earnest. Later, we were startled by peels of thunder, their violent echoes ricocheting around us. Thunder in winter? We marveled. It was a little frightening, yet magnificent. Kind of like these beans—the magnificent part, that is—ladled over brown rice or whole-grain pasta. By the way, like bouef Bourguignon, these beans taste even better the next day. Place navy beans in a Dutch oven in cold water to cover by 3 inches. Cover and soak for 6 hours. Drain well and rinse. Place beans back in Dutch oven in cold water to cover by 3 inches. Cover. Bring to a boil (about 8 to 10 minutes) and let beans boil for 2 to 5 minutes. Turn off heat and let beans steep for at least 1 hour, no more than 2. Warm 1 tablespoon of olive oil to a heavy-bottomed pot. When the oil is hot, but not smoking, add pancetta and, over medium low flame, render the fat from the pancetta. Stir constantly to keep pancetta from burning. When fat has been rendered, apx. 8-10 minutes, and the pancetta is crisp (but not burnt), remove from heat and transfer to a small bowl. Set aside. To the pot with rendered fat, add 2 tablespoons olive oil. Heat over medium flame until the oil is hot, but not smoking. Add onion and cook, until browned and caramelized (about 8-10 minutes). Add chipotle powder and tomato paste. Stir about 30 seconds to 1 minute. (If the bottom of the pan blackens too quickly, pour in a little water to deglaze.) Add the carrots and garlic, mixing until well combined, 1-2 minutes. Add white beans, combining well. Stir in the herbs. When mixture is well combined, add crushed tomatoes. Cook until mixture begins to bubble. Add 5 cups of water. Bring the entire mixture to a roiling boil. Stir well, cover and lower heat to a simmer. Cook about 1-1/2 hours. Add the pancetta back to the pot. Cook, covered, another 30 minutes, stirring constantly. Uncover. If, at this point, the beans still look soupy, raise heat and cook another 15 to 30 minutes, or until most of the liquid has evaporated. Serve immediately over brown rice or whole wheat pasta. Or, cool and refrigerate. This entry was posted in Food, Health, Home Cooking and tagged complex carbohydrate, dietary fiber, navy beans. Bookmark the permalink.